Our highly mobile "Cool-Mules" shown above, are designed for quick, mobile air-conditioning on-the-set indoors & outdoors. Mounted on all terrain RV's. Just plug into 110 Volt outlets & add water every 5 hours. Evaporative-type coolers. Use one RV to cool small to medium spaces. Use several mobile units to cool large spaces. 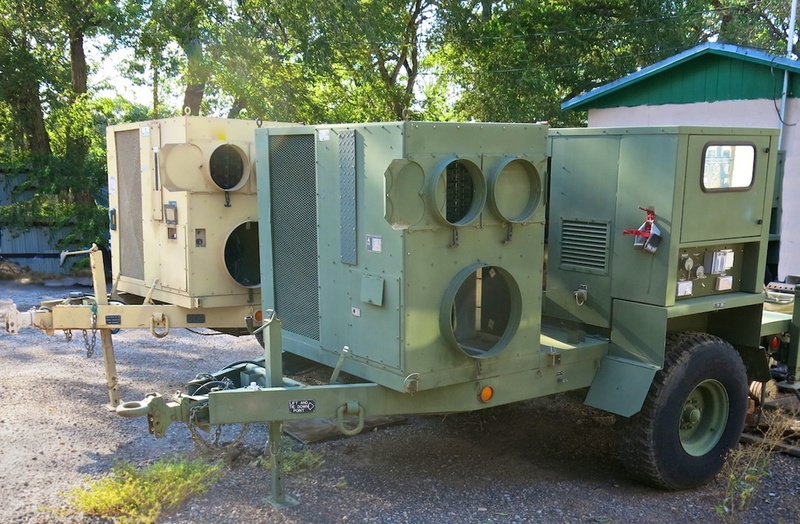 Our mobile 10 ton "Air-Conditioner & Heater-Trailers" shown above, cool off or warm-up large in-door sets. Set up outside & duct tube the cold air in. They are 10 ton, diesel powered. Unit shown at left, duels as a 110 & 220 volt, 25 KW generator. Call for details. Our mobile "Air-Conditioning Comfort Station" seats up to 15 people for a cool-off. Sides fold out for extra shade. Diesel powered.